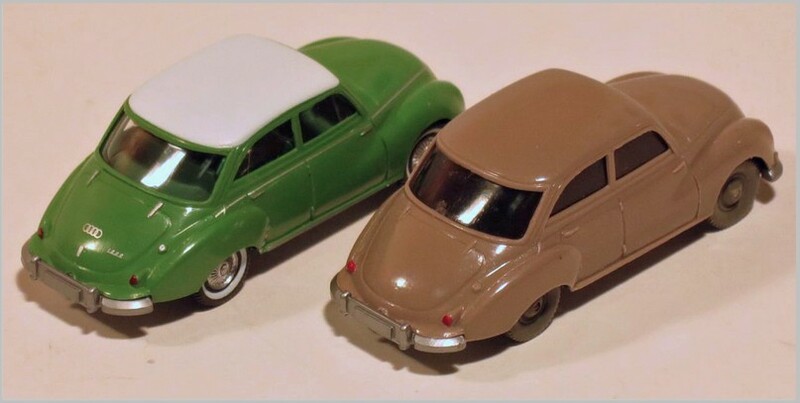 In the recent upgrade releases by WIking there were three models which were first issued in the 1960s. I have the original releases in my collection so I have taken this opportunity to compare the originals to the re-issues. The re-issue is in green with a white roof. This model was launched in 1962, and modified in 1965 by adding a hook to pull a trailer. The body was moulded in brown, headlights and radiator grill painted in silver, and rear lights in red. Windows are pierced and tinted, but there is no interior. It is fitted with a well detailed baseplate. The new release is moulded in light green, and the roof printed in white. 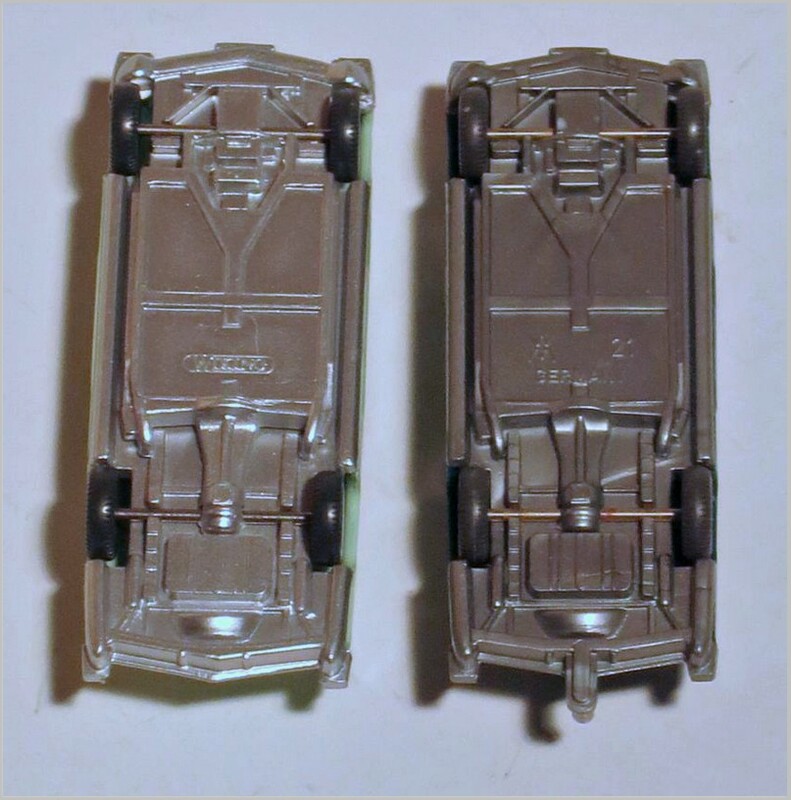 Headlights, Radiator grille and a number of mouldings are silver printed, as are the badges and emblems. Front indicator, and rear lights are painted. The windows are clear and reveal an interior with seats and steering wheel which have been added. The good baseplate is unchanged apart from the “WM” branding has been changed to “Wiking”. The car in black is the recent re-issue. 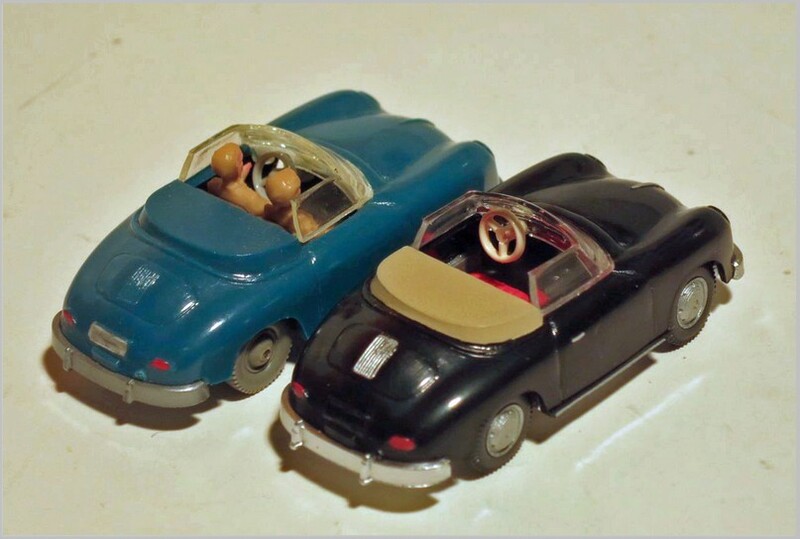 The Porsche 356 was released originally by Wiking in 1961. 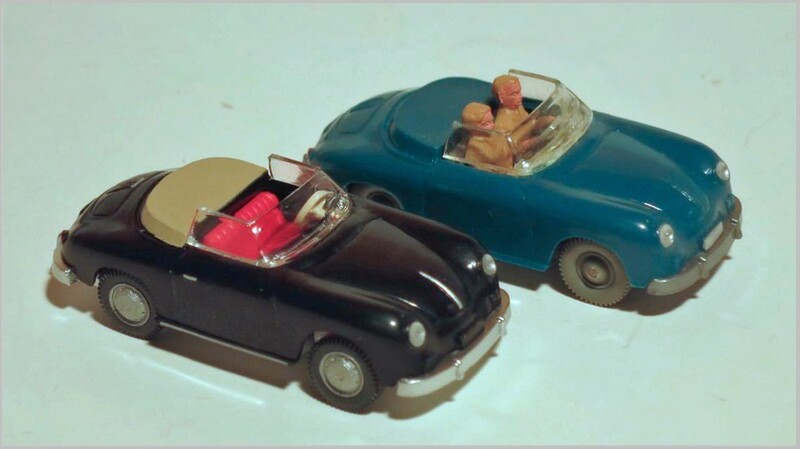 It featured figures of a driver and his wife or girlfriend. The body was moulded in several colours but the example shown in in blue. The windscreen and side windows unit was glued on. Headlights, number plates and rear lights were all painted. The baseplate has good detailing. The tiny Porsche has now been re-issued with a body moulded in black. This time, the car is empty, with red seats and a white three pointed steering wheel visible. The windows are unchanged. 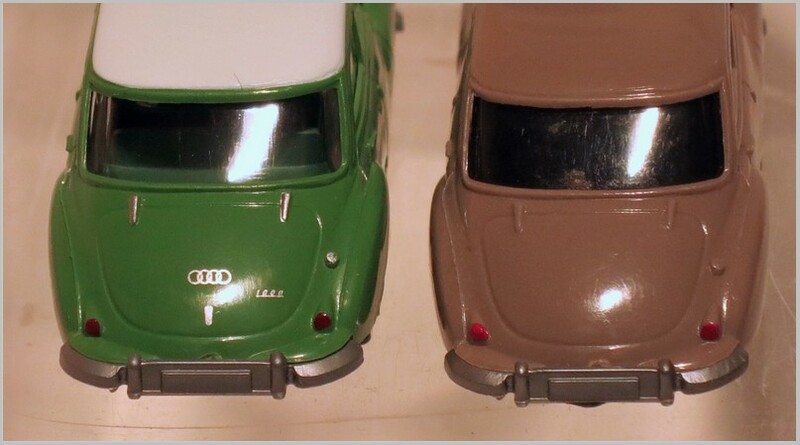 Head and rear lights are painted, The baseplate is similar too with WM removed and “WIKING” and “Germany” added. New wheels have been fitted with more authentic hubs and rims. The moulding on the bonnet and the grille, and the air intake on the rear engine cover are silver printed. 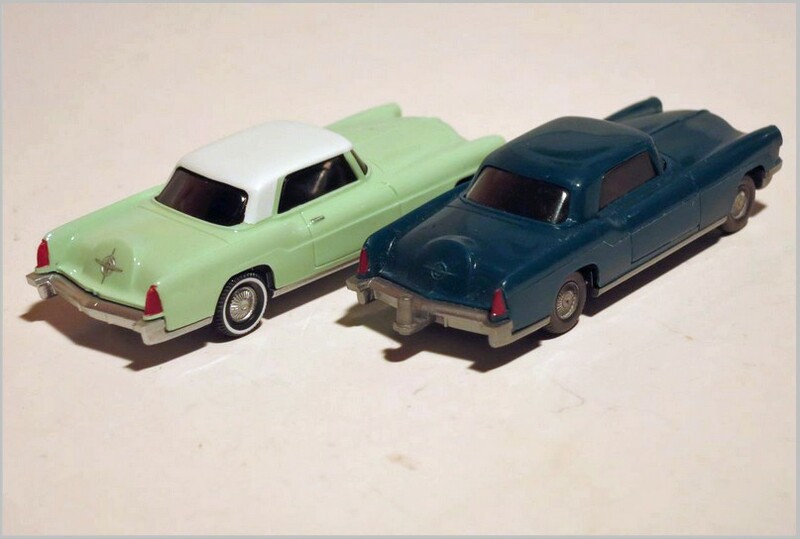 The car is green with a white roof is the re-issue. This Ford Continental model was released originally in 1960 and the body has been re-issued in many colours over the years. 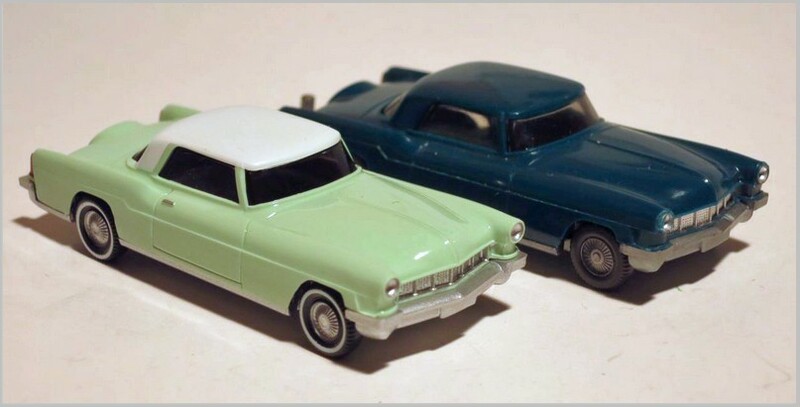 The two-door coupe was a large car and made an impressive model even in a small scale. 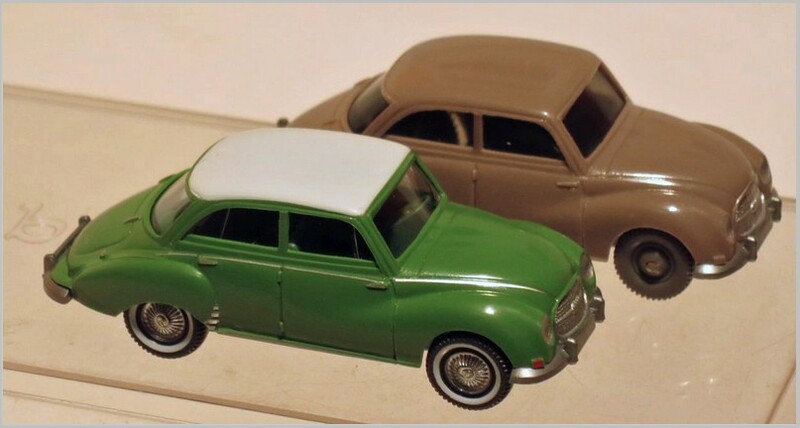 The windows were tinted in the original model and no interior was fitted. Again a detailed baseplate was modelled. A hook to connect trailers was added during later years of production. It has been re-issued with its body painted in light green, and the roof in matt white. The base now includes the “WIKING” branding. The re-issue has no hook fitted. There is still no interior fitted to the model. Radiator grille, headlights, door handles and the Continental emblem on the spare wheel cover are printed silver, and the rear lights painted red. Whitewall tyres are fitted to add to the visual appeal. 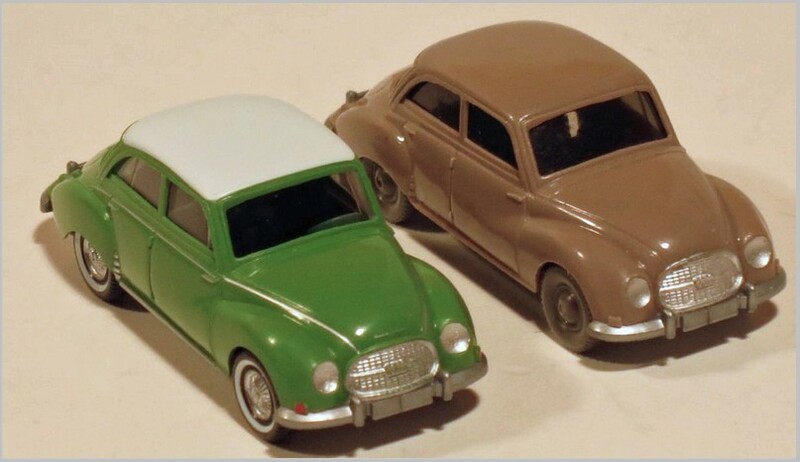 More than fifty years after these models were first issued they have been re-released with scarcely any changes to the basic mouldings. Yes, printing and painting have improved over what could be achieved in the early 1960s but the accuracy and quality of the mouldings is a tribute to the skills of Wikings tool makers and the quality of the moulds they created.